Prohibition brings greed, corruption, murder and intrigue to a coal mining town nestled in the Allegheny Mountains of Pennsylvania in this debut novel by author Darlene Frances DeAngelo. Jeremy Sinclair thought prison was the worse place to be, until he’s released for good behavior and walks for days to his former hometown. Jeremy, locked up when he was 13 for running guns over the Canadian border, can’t believe his eyes when he sees the changes that have taken place in the last 22 years, and things go downhill from there in this action-filled story. Baxter City, an old coal mining town, has been booming, including business at a speakeasy that opens in this era of prohibition. Corruption, greed and violence – including murder – soon come to the rural Pennsylvania community. 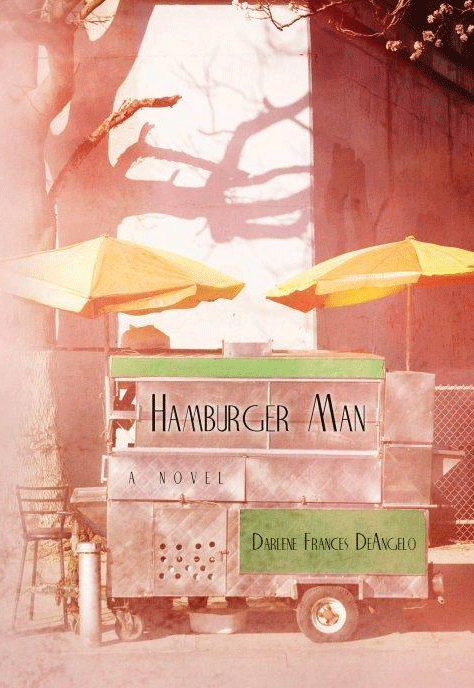 “Hamburger Man” features an unforgettable cast of characters, from the hard-working, feisty Ida Mae to a Mafia psychopath named Santos to a bully named Shorty who enjoys inflicting pain and taking advantage of those who have nowhere to turn. Jeremy finds himself at Shorty’s mercy once he discovers a long-buried treasure is out of reach. He starts as a dishwasher but quickly becomes tangled up with murder and intrigue every day. Can he survive long enough to make his escape? Rapid-fire dialogue and detailed descriptions of people and places help set the pace for this psychological thriller. The author’s deft storytelling provides a window into life during an era of fast-paced change and uncertain morality. This is the first novel for author Darlene Frances DeAngelo, who grew up on Pittsburgh’s north side. She earned a master’s degree in national security and strategic studies from the U.S. Naval War College and a master’s degree in educational sociology from Wayne State University. For additional information, please visit www.franceskaye.net. Available at Amazon.com and www.createspace.com. This entry was posted in New Book Releases and tagged Allegheny Mountains, Baxter City, coal mining, corruption, Darlene Frances DeAngelo, ex con, Frances Kaye, greed, Hamburger Man, Mafia, morality, murder, Pennsylvania, prison, prisoner, prohibition, Prohibition Era, speakeasy, thriller, violence. Bookmark the permalink.